The Venetian® Macao; The Plaza™ Macao featuring Four Seasons; and Sands® Cotai Central featuring St. Regis, Conrad, Sheraton, and Holiday Inn — including at the project site of The Parisian Macao. It marks the eighth year in a row of Sands China’s participation in the worldwide environmental endeavour, which has a goal of raising global awareness of climate change by encouraging eco-conscious individuals, communities, households and businesses to switch off their lights for one hour. Team members are encouraged to take on multiple challenges and to repeat single challenges as many times as possible during the campaign period. Those who participate have the chance to win prizes like a Fitbit or an Apple Watch. Implementing environmentally sustainable initiatives at its properties is a long-running strategy for Sands China. Annual participation in Earth Hour is just one of the many ongoing efforts of Sands ECO360 degree. In the area of electricity conservation, energy saving LED lights and optimization of heating, ventilation and air-conditioning systems saved a total of 46 million kWh of electricity in 2015 — enough to power more than 115,000 households every month. Sands China’s eco-friendly measures have contributed to more sustainable operations while earning the company recognition for its efforts. 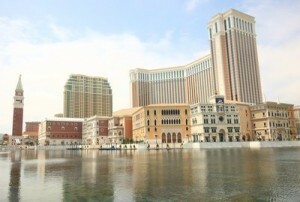 In April 2014, The Venetian Macao became the first entity in Macao and one of the first two integrated resorts in Asia to receive the prominent ISO 20121 Event Sustainability Management System certification. In 2015 it received an ISO 9001:2008 certification for the quality management system of its convention and exhibition services. Five hotels at Sands China properties are winners of the Macao SAR government’s Macau Green Hotel Award, with four Gold designations and one Silver. These and many other awards continue to highlight the success of Sands China’s ongoing sustainability efforts.